Throughout history, attempts have been made to organize spaces in which audiences gather to experience live performances. From Greek and Roman amphitheatres to the great European opera houses and concert halls, various buildings differing in size and type have emerged to cater to each performing art’s specific requirements and traditions. In the latter part of the 20th century, however, a major shift in theater buildings took place when they progressively moved from being bastions of culture to urban connective and popular performing arts centers (PACs). Still home to traditional performing arts, they were also becoming true gathering places for communities, called on to play a far greater economic, social and educational role. The built environment for these new sophisticated centers, drawing more attendees on a daily basis and carrying out community-oriented missions, had to be re-imagined. Part of their success would then lie in aligned physical spaces capable of hosting various types of events, from educational, civic and local business activities, to new forms of creative expression. Because it is neither feasible nor practical to create several halls each optimized in terms of both size and specific needs for specific events, architects and venue managers have been looking for increased versatility in theaters. This is when conversion methods come in. 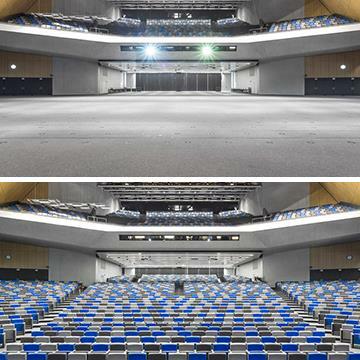 To ensure a minimum of versatility, a hall has to transform itself from a raked seating layout to a level flat floor. But aside from just placing stacking chairs on a flat or staggered floor, alternating from one configuration to the other is a complex operation in which logistical, engineering and safety requirements dictate the use of some sort of prearranged specialized equipment. For decades, TELESCOPE and CHAIR-WAGON methods prevailed to afford spectators at least basic comfort and organizers a minimum of effort. Many of today’s auditoriums have seating capacities of 2000 or more, a necessity to offset the costs of presenting touring shows or symphonies. When capacity exceeds demand, however, it has a negative effect on guests who may be deterred by too many empty seats; dealing with halls that are significantly larger than necessary for the audience present has become a frequent problem for managers. What is also at stake for architects and facility owners is the need to ensure continuity and innovation in the performing arts through the appreciation of exceptional works, so naturally they do not wish to take action which could sacrifice this overall mission. Ultimately, built-in flexibility should not hinder a venue from serving its constituents as well as a fixed single-purpose venue in terms of acoustics, sightlines and comfort, and indeed it should enable a venue to quickly match its capacity to frequently fluctuating audience sizes. To address these issues, partly left unresolved by traditional conversion methods, Gala Systems, a full-scale engineering and manufacturing firm specialized in under-stage lifting equipment, introduced in 2002 the INDEPENDENT ROW/LIFT SYSTEM. This novel solution – in which theater-style chairs may be raised or concealed under the floor structure – was an architectural breakthrough in theater design at the time. The technology behind it has been trusted for over 25 years in the scenic, aerospace and automotive industries: the SPIRALIFT® , a compact yet powerful stainless steel lifting system. As to how it works, the answer is simple: with just the touch of a button. A remote equipped with a control screen allows a single technician to modify the entire space layout, most often in less than 15 minutes. The rows of seats pivot, the floor lifts and lowers, and stage elements appear or disappear to transform the hall for any presentation: symphony, cabaret, rock concert, opera, dinner theater, and conference gala, to name a few. Virtually endless sub-configurations are available to suit not only the particular needs of an event, but also all audience types and sizes, so that nearly every performance can look full. From the Melbourne Convention Centre by way of the refurbished Campos Eliseos Theatre in Bilbao and the Capitol Theatre in Singapore, the Gala Venue concept has seduced architects and venue managers around the world, who expect the highest standards when it comes to structural stability, design, materials and finishes. And as for the audience, it is impossible to tell the difference between a traditional venue and a “transformable” one. For more than 15 years, the Mont-Jacob Cultural Centre in Jonquière, Quebec, has been kept full and active. Its 396-seat main auditorium, the first to be equipped with an automated Gala Venue Seating System, was shown to host 40% more events on average than would have been possible in a traditional fixed stage-house building (1). Data covering a 3-year period (2014-2016) also proved the transformation system helped the Centre fulfill its mission as a community-serving asset for the production and presentation of performing arts. In particular, it was extensively used to achieve optimum stage and auditorium configurations – 85% of the time – by showcasing various types of events and accommodating frequently fluctuating audience sizes. Opening its doors in 2014, the Tobin Center for the Performing Arts in San Antonio, Texas, also made good on its promise to serve a strong community-oriented mission with a multipurpose Gala Venue Seating System. As anticipated, it had absolutely no trouble attracting audiences through a broad variety of events with 10 resident companies – including symphony, opera, ballet, chamber orchestra, theater, choral and youth music/theater organizations – world-class performing artists from Paul McCartney to the B-52s, and local community groups, such as the Tobin Kids Series. The flexible 1750-seat auditorium hosted 212 events in its 2014-2015 inaugural season (2). By contrast, fixed audience chamber seating facilities are typically underused in the US, averaging 124 events per year between 2009 and 2012 (3). This represents 2.4 shows per week compared with four at the Tobin Center, which had no need to request any annual subsidies in its first year of operation (4). To make a debut with such a high level of use, it had to rely on very quick and easy space transformations, according to Duncan Webb, President of Webb Management Services Inc. Further, its multipurpose hall had nothing to envy of the best acoustics venues after running sound tests. As outlined by the San Antonio Express News (5), experts from Connecticut-based Akustiks LLC concluded that audiences would be blown away by a sound quality they hadn’t heard before. As opposed to some cultural buildings becoming quickly outdated, more and more PACs are becoming multipurpose to accommodate events in a broader range of arts, cultural and community programs. How closely a space is tailored to each unique performance and audience size may determine whether it will be festive, shared and compelling. The establishment of the best possible technical venue transformation (speed and functionality) then becomes crucial to be able to respond appropriately to live performance requirements and satisfy audiences’ expectations in terms of environmental factors, such as comfort, sightlines and surroundings. In today’s competitive performing arts industry, the Mont-Jacob and Tobin Center cases illustrate perfectly how an advanced technology providing a high level of programmatic and operational flexibility, like the Gala System, may be a key element for PACs to achieve increased overall usage rates and deliver on their mission statement. Since their inauguration, these flexible centers have made sure that spectators always get the most out of an event and they have rapidly become true gathering spaces, valuable and relevant to their community. Indeed, this is what they will remain for years to come, as their adaptability to the evolving size, shape and functionality of performance spaces allows them to distinguish themselves from other performing arts centers. Note 1 “PIERRETTE-GAUDREAULT HALL, MONT-JACOB CULTURAL CENTRE, VILLE DE SAGUENAY, QUÉBEC, CANADA Three-Year Case Study – 2014-2016.” Claude-André Roy, Gala Systems, 2017. Note 2 “THE GALA VENUE SEATING SYSTEM AT THE TOBIN CENTER FOR THE PERFORMING ARTS Progress Report: FIRST 20 MONTHS SINCE 2014 OPENING.” Duncan Webb, Gala Systems, 2017. This article and all images were provided to the McLerran Journal by Gala Systems Inc. Permission to publish all information and images was obtained in June of 2018. Newer PostWhat is an Ocarina?